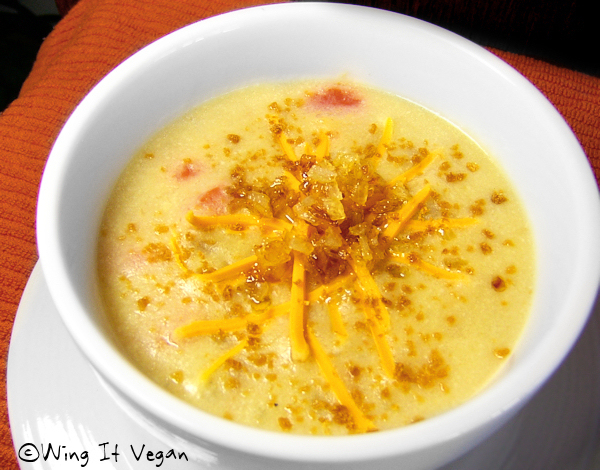 Wing It Vegan: Cookbook Love: Cookin' Crunk! Hi, y'all! We interrupt this blog hiatus to bring you some cookbook love! This crunk post should be read in your best Memphis accent for maximum enjoyment. I have been working on this Cookin' Crunk post since January, but travelling has a way of slowing things down, and you know how I love writing epic, never-ending cookbook posts. I haven't actually been able to bake anything for a while, or cook anything that requires more than the most basic kitchen tools, so writing this post and looking at the pictures I took before we left is making me miss my kitchen. You might have seen some of these pictures already if you've been hanging out with me for a few years, because I used to be one of Bianca's few lucky recipe testers for her cookbook. Bianca put together a stellar cookbook full of easy-to-follow recipes that will rock anybody's socks off! Cookin' Crunk truly is a treasure and I will recommend it to anyone who wants to enjoy delicious Southern cookin' - vegan or not! Let's go ahead and start with the "Sweet Endings." Bianca's Choco-Chocolate Praline Cookies are dangerously delicious and one of my favorite cookies ever. 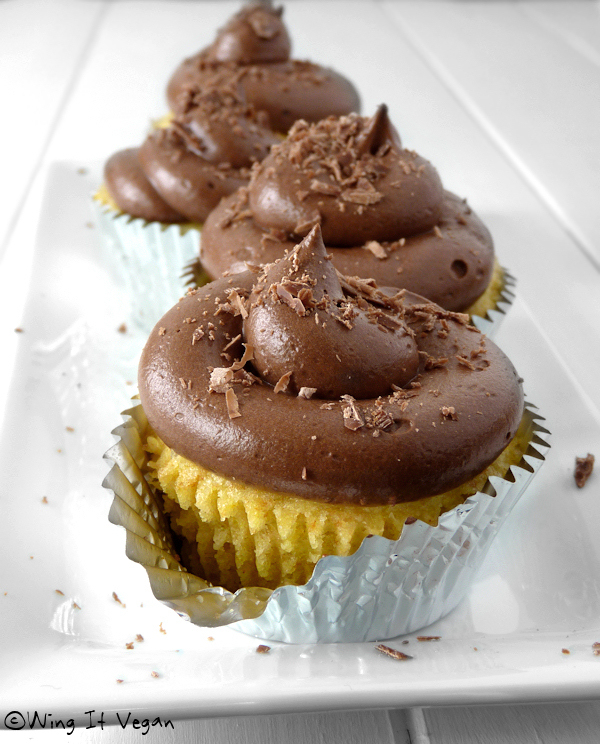 I'm talking scarf-down-a-whole-batch-in-a-day delicious! 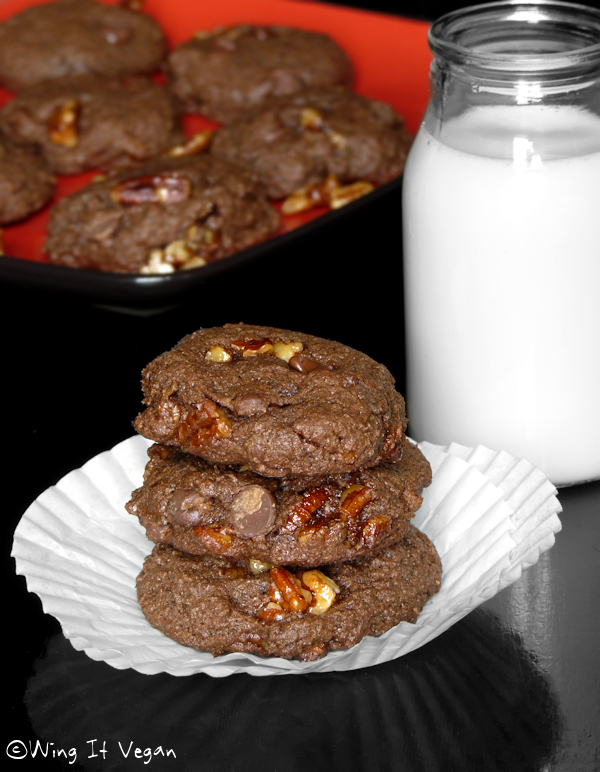 The sweet, maple-coated pecans really make these cookies special - throw in some gooey chocolate chips and you're in trouble! I'm not a big fan of my birthday, but I am a big fan of birthday cupcakes. Bianca's Yella' Cake with Fudgy Frosting was a perfect recipe to sweeten up my birthday last February. As you can see, instead of making a big cake I made cute little cupcakes. Turmeric gives the cake a lovely yellow color without us having to reach for the artificial yellow #5, and the chocolate frosting is so amazing I could eat it all straight out of the bowl! The Fresh Strawberry Pie is so good, even if the last time that I made it (to take this picture) strawberries weren't in season and they were rather pale. 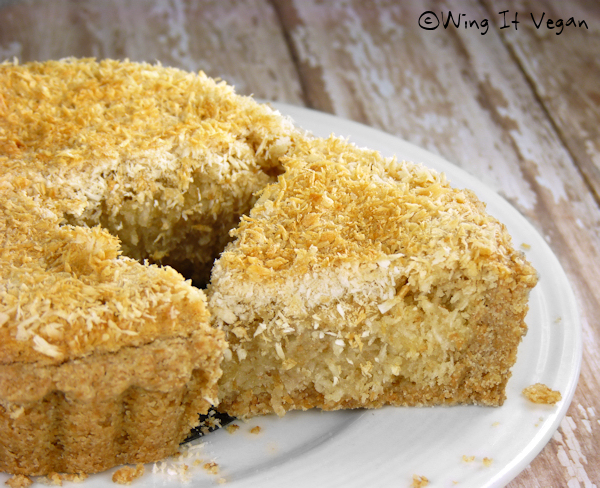 I always enjoy mine with a little scoop of vanilla coconut-milk ice cream - a perfect combo! I made minis. It's what I do. 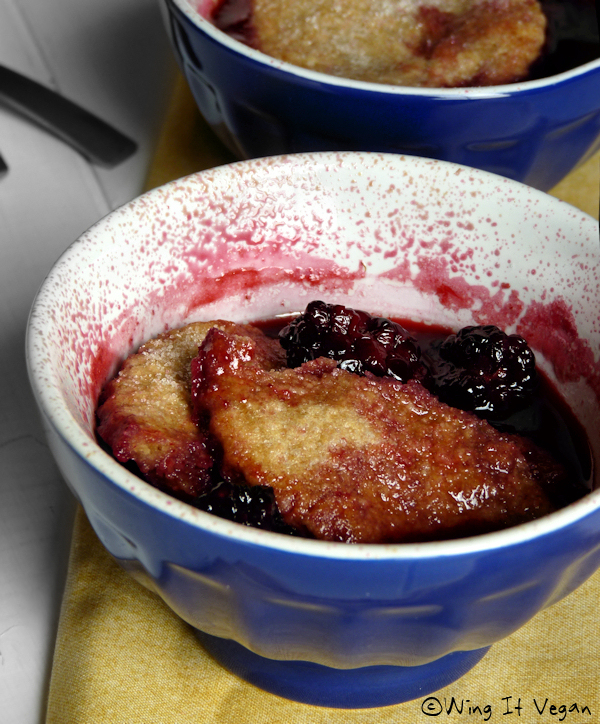 I'm not a huge fan of blackberries, or more precisely blackberry seeds, but the Whole Wheat Blackberry Cobbler was lovely in spite of my hatred of berry seeds. 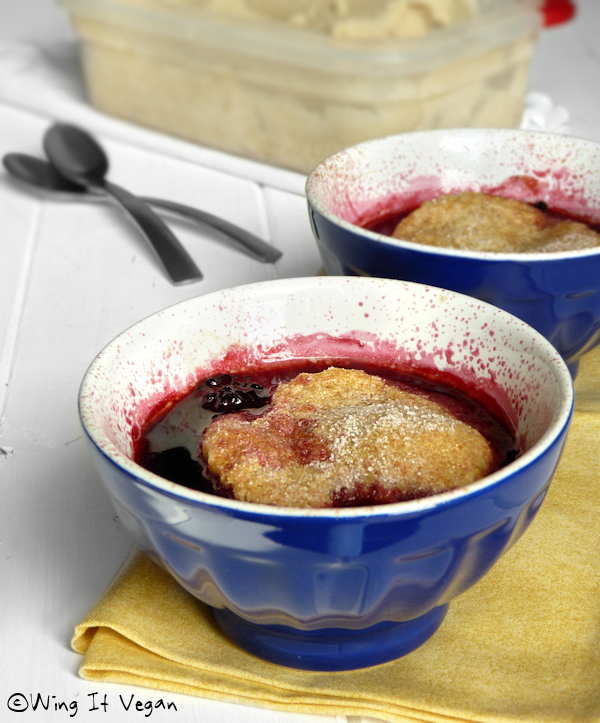 As you can see, I baked mine in individual ramekins and the blackberries got very excited in the oven, enough to decorate the edges of the bowls with pretty little specks! Look how juicy my fresh blackberries were! You're not having a déjà vu. This is one of my old tester photos. 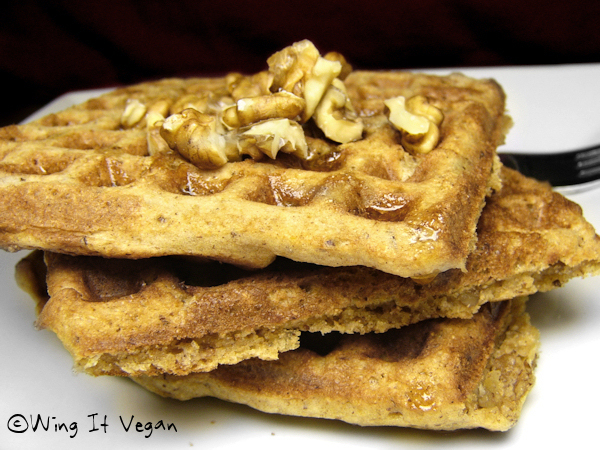 The Cinnamon-Pecan Waffles are... they... I... I can't even handle how good they are! It's insane! They are just incredible. 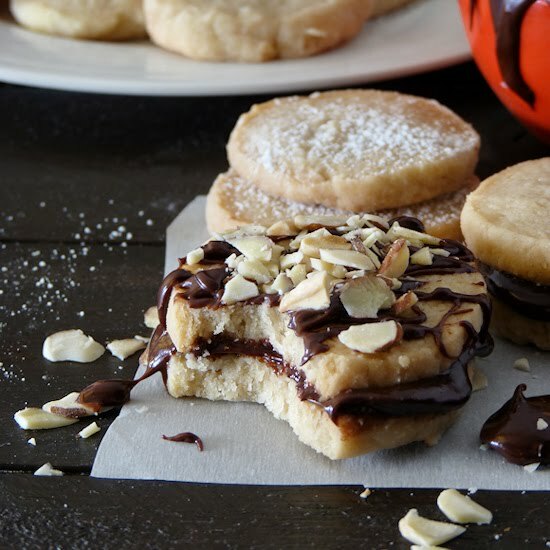 They are nutty, cinnamony, squares of awesomeness. The batter smells so good when it hits the hot waffle-maker and the scent takes over the whole house. Add some maple syrup on top and your soul will belong to these waffles forever. Yep, these are my favorite waffles. Another oldie from my tester days. Should we have some savory treats now? 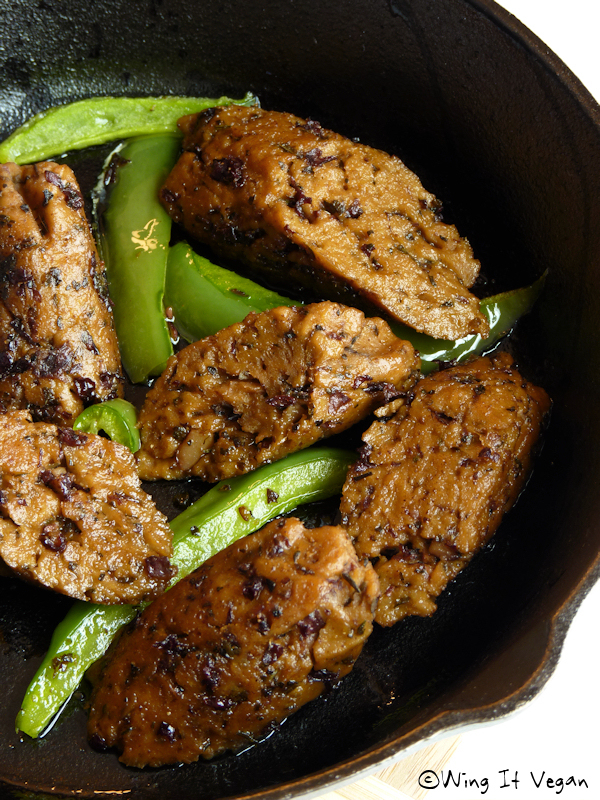 How 'bout some Creole Steamed Sausages? I am not the most skillful vegan sausage-maker, but even I managed to make these and they were glorious! Spicy and flavorful, just like I like my fauxsages. As you can see here, I used red kidney beans (those dark spots are bean bits) instead of the white beans that I was supposed to use. That's what I get for going grocery shopping without a shopping list. The Southern Tofu Chicken Biscuits are so incredibly tasty that I took a bad picture because I was in such a hurry to eat mine. This stuff is beer-battered, people! Beer battered! This was my tofu splurge of the month (in case you don't know, soy doesn't agree with me if I eat it too often) and it was so worth the wait! Beer battered! Is this post getting too long? I'll try to speed things up! 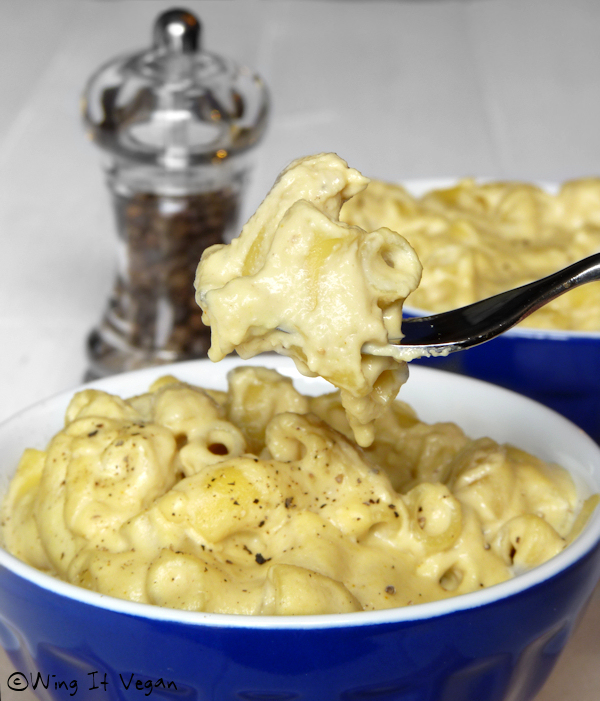 The Creamy Cashew Mac and Cheese is wonderfully creamy and delicious indeed! 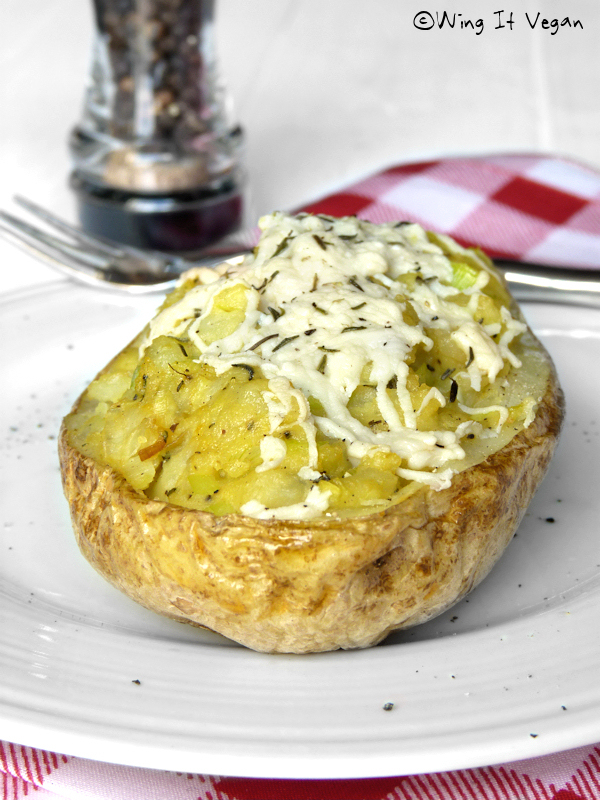 The Cheesy Twice Baked Taters with Leeks and Dill are insanely tasty - forget the main dish, just give me extra taters! Oh, look. 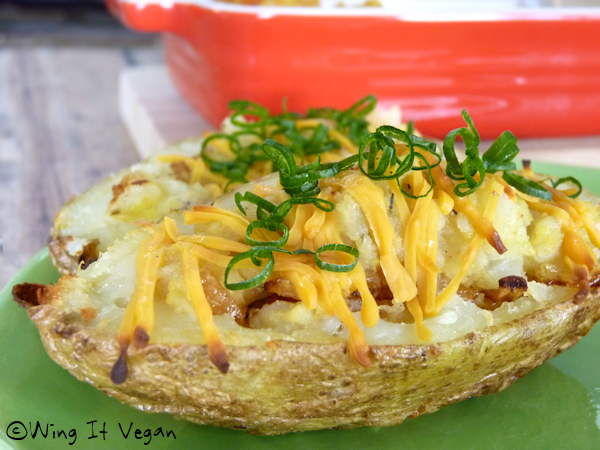 Here they are again with chives and... maybe Galaxy Rice Vegan Cheddar? Can't remember! The Fried Squash is fabulous! So easy and crispy and tasty! I can't remember what I sprinkled on top of my soup there. Fried onion bits? Glow worms? 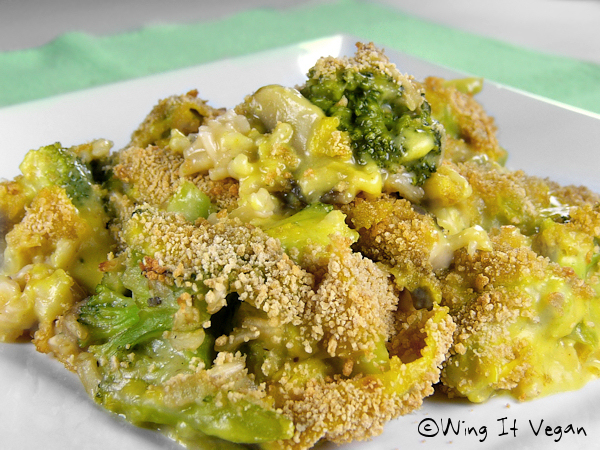 The Cheesy Broccoli-Rice Casserole is a wholesome, belly-warming dish that I could eat every day. It looks a bit messy here, but the messiness just adds to the homemade, wholesome experience! 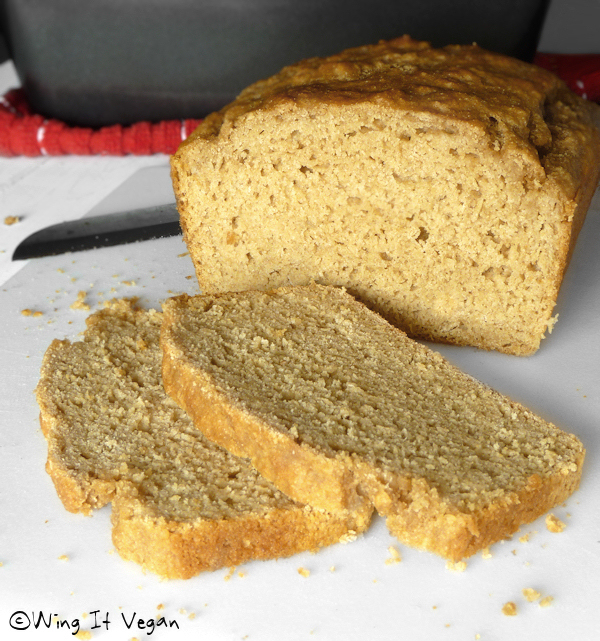 And I've saved another one of my favorites for last - Whole Wheat Beer Bread! So quick and easy to make! This bread is one of those things that I need to half or even quarter the recipe or I'll eat the whole loaf in a day. Good luck to Mr. Wing-It trying to grab a slice before I hide it all in my belly. Phew! That was a long one! 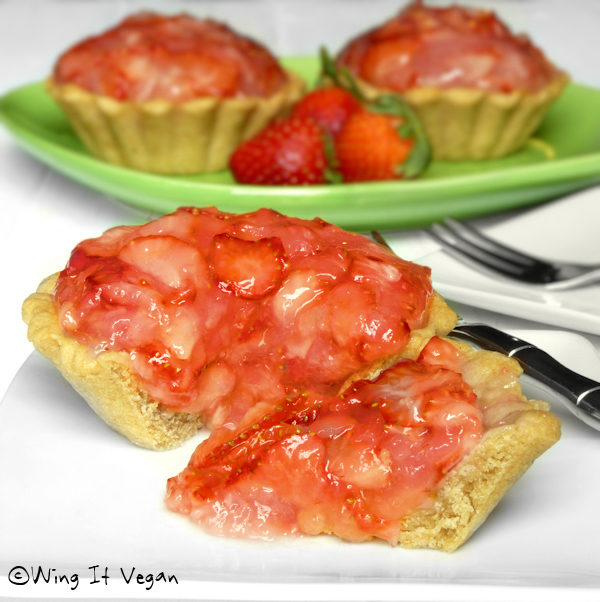 Check out Bianca's blog, Vegan Crunk, for more vegan awesomeness. Bianca has been blogging regularly since 2007, so her blog is bursting at the seams with recipes, restaurant reviews, and all sorts of vegan greatness. Plus she's so cute and witty and funny, and all her annual Happy Solstice posts with all her furry companions opening their gifts are adorable and hilarious. Bianca for president! One more thing before I go MIA again for a while. 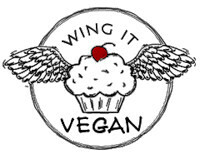 If you follow Wing It Vegan on Facebook, you might have noticed an update from me where I shared the awesome news that Cindy has started a blog!! I knew she'd come to the dark side eventually! Cindy's family is in the process of adopting a beautiful little girl from Ukraine. I am quite fascinated by international adoption stories, even more so when the story involves an "older" child who is embraced by an adoring family. Cindy is sharing their adoption experience with us from almost the beginning, so I'm pretty sure by the time their little Maria arrives home, we're all going to be shedding a tear of joy... or ten. Check out Cindy's blog The Other 1%, where she blogs about her "vegan, homeschooling, soon-to-be-adoptive family." Awesome review! And those strawberry pies! Holy gorgeousness. I'm also super wanting one of those tofu chicken biscuits now too. Hi Jes! 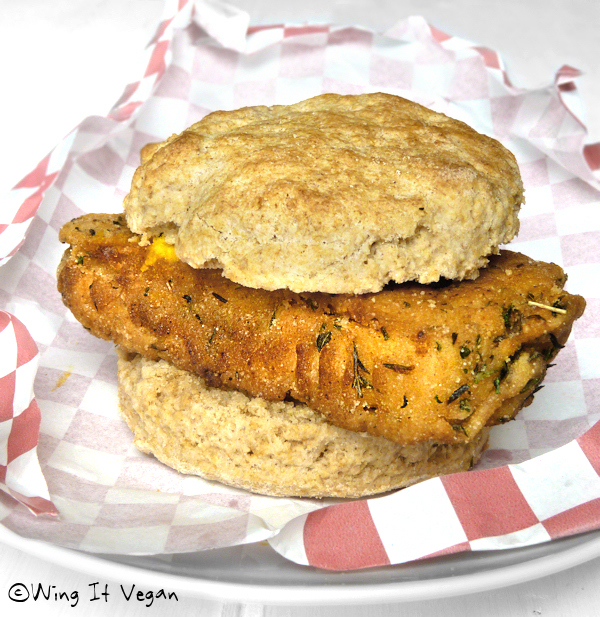 The tofu chicken biscuits are so yummy! 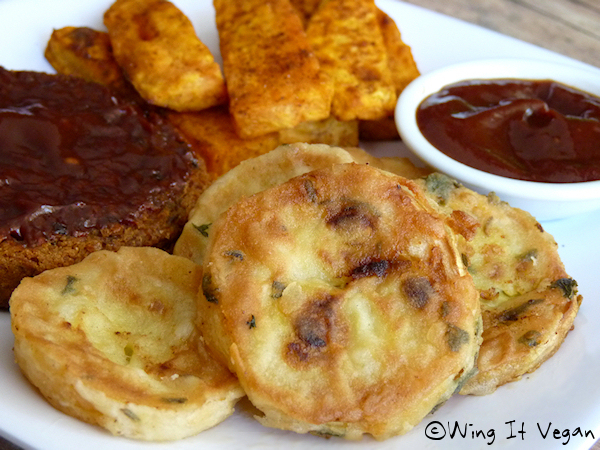 Even if I don't eat much soy, the beer batter can be used to make so many tasty things. Michelle says: Hi. All those recipes look sooo YUM! Question tho: I also cannot do major sources of soy (like tofu, tvp, etc). So does this book have many soy-free recipes or at least soy-free options attached to them? And how 'bout gluten free? (tho I will sub gf flour, also when it calls for wheat gluten or seitan, I'll sub mushrooms or solid quinoa-polenta, where appropriate, anyways). Thanks so much! Good question, Michelle! This cookbook is soy and gluten heavy, but I am used to swapping tofu and tempeh for mushrooms or lentils or other suitable ingredients. It sounds like you're used to doing that too, so I think you'd be OK when it comes to replacing the soy products. I don't have the book with me, but I'm pretty sure most of the baking recipes call for soy milk, which I have successfully replaced with almond milk. 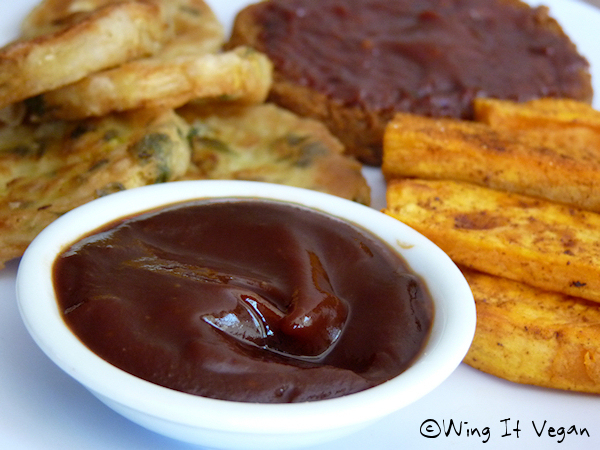 The sauces, batters, and frostings are also easily made with non-soy milk and "butter". If you're used to using gluten-free flour to modify recipes that are wheat-based then you should be fine, but I have not tried doing that myself. Sorry I can't be of more help - I wish I had the book here so I could give you specific examples! Gorgeous photos; everything looks tooootally incredible! Especially the creole sausages and the tofu chicken biscuit. Yow. YEA!!!!!!! RIVER, THIS IS AWESOME!!!! Thank you sooooooo much!! I'mma tweet and Facebook the hell out of this. It was my pleasure! I feel like I barely got started with Cookin' Crunk before we had to hit the road, so I might need to work on a part two post when we go back home. The tempeh gumbo and the bbq pulled tempeh sandwiches are at the top of my list! Wow, you weren't wrong about loving an epic cookbook post!! So many things appeal to me here, the beer battered tofu, the mac & cheese, the beer bread! Yum! I can't help myself! That beer battered tofu and the beer bread might make a great pair, don't you think? Next time I'll use the beer bread instead of the biscuits to make the tofu chicken sandwich just for kicks. OK apparently I need to dig this book out because I've not made anything from it since I bought it and everything you've made looks amazing. 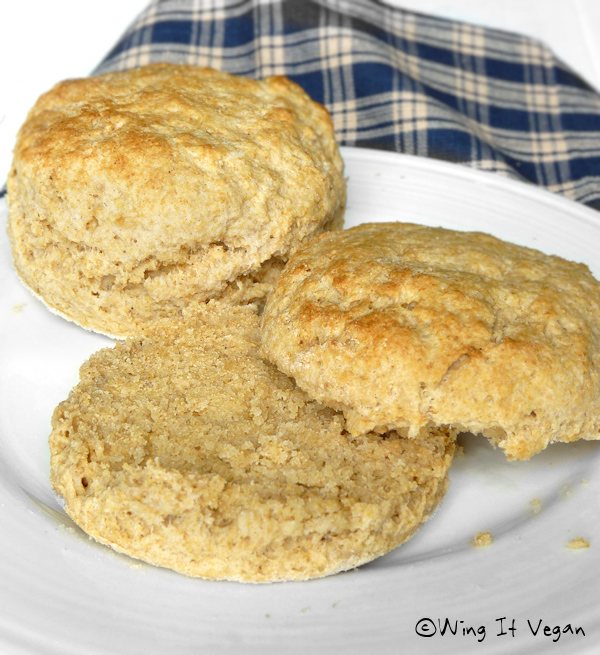 I might have to make that tofu/biscuits this weekend! All I can say is if I ever write a cookbook (hahaha) you are the person I'd want to review it. Seriously, you make everything look fabulous. Right. Actually, there should have been a few more "hahahas" in there. Wow! Everything looks so phenomenal! I added your friend's blog to my Bloglovin' reader. I am always interested in adoption stories too. I'm looking forward to checking it out! Awesome! I can't wait to hear more about Cindy and her family's adoption. Ever since Cindy first wrote about adopting, I have been obsessed with reading adoption blogs! I love it when you come out of the woodwork, especially in these HUGE posts that leave me salivating and wishing that you lived nearby so that I could hire you as my personal chef. I'd try to entice you here with birds, but since it is SNOWING AGAIN right now, I don't think you'd be wise to come here. IN fact, stay far, far away! Awesome review! I got this book for Christmas and though well thumbed and drooled over, it is yet to be cooked from! Must remedy that. So glad to see you blogging. :D Hope it isn't too long until the next one.